It was a long time since I had been out to meet a large gathering of people, who were all new to me – although I had interacted with a few on social media. The first blogger I met was Helen of www.kiddycharts.co.uk – we chatted for a while as we gathered up the courage to go off and meet other people. Most people, who had not already formed groups of more than two or three, were friendly. More people approached me than I accosted. There were bloggers, judges (I met one of the education category judges and his PA), press, social media professionals, friends and family of bloggers and the co-workers of some of the above-mentioned. The majority of people were from London and the south of England, although I did meet two people from Scotland and the organisers, Gemma and Becki, are based in Preston. Two other bloggers had requested me to represent them at the Awards Evening. The first to do so was Arlee Bird, the founder of the Blogging from A to Z in April Challenge. For any new readers, this is a challenge which has been run for five years. It is increasing in popularity and attracted over 2000 participants worldwide this time. The other request I had was to represent another short-listed entrant, who was unable to attend. He is Fletch the Perchcrow, a scarecrow who lives in the garden at Wordsworth’s House in Cockermouth, Cumbria. This National Trust property was the childhood home of William and Dorothy Wordsworth. Before the awards were announced those present circulated, while drinking sparkling wine and eating kebabs and other tasty morsels. I recognised the Fairy Blog Mother, Alice Elliott from her photos online and she introduced me to her friends. 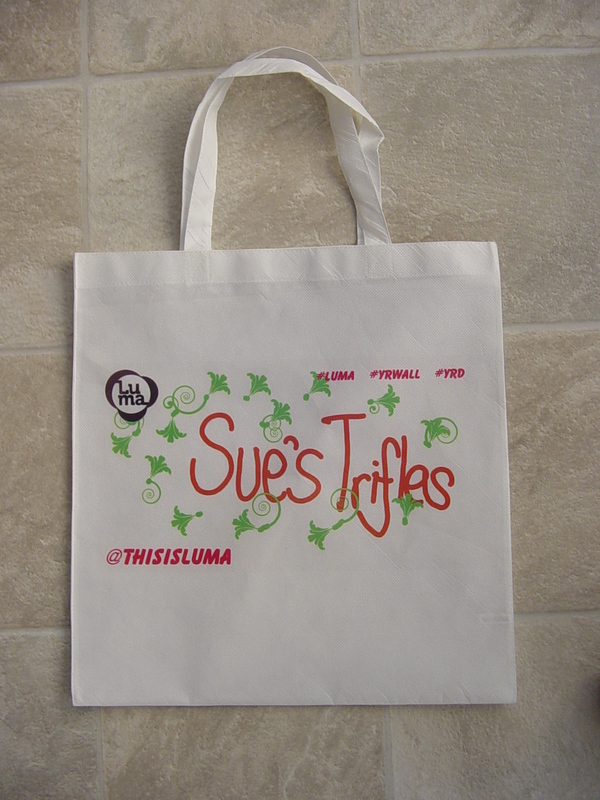 Then she had a turn on the Luma Wall, designing a bag. At first I didn’t want to have a go, but after watching her and seeing how easy it looked, I designed my own bag. I was told it would be ready in a few minutes, but the print queue became very long and I hadn’t received my bag by the time I went to sit down ready for the presentation of the awards. My blogs were both short-listed in the education category. I had looked at the blogs of the opposition and knew that mine had little chance of being selected. I was more relieved than disappointed, when they were not even highly recommended. The winners are listed here. Afterwards my bag proved somewhat elusive, but I spotted it for myself and was very pleased with it. It will be a reminder of a very special evening. I showed it to Gemma, by way of introduction. She must be familiar with the names of all the short-listed blogs. Later I met Becki and we had an interesting conversation. She had been very busy live-tweeting the proceedings for those who were not present. One of the bloggers, who had taken part in two other challenges I had done or was doing (Blog Every Day in November #BEDN and the #atozchallenge), was a winner. This was very helpful to me, as I had been hoping to meet her, but without a smart phone to Tweet to her I was unsure how to find her. She is the OCD Squirrel. We had also taken part in a few #bloghour sessions on Twitter in the build-up to the awards evening. Two other delightful young ladies, who introduced themselves to me, are Raj of secretweddingblog.com and her sister Rita of ritadharar.com. The charity chosen by the UK Blog Awards’ organisers was The National Autistic Society. I was happy to buy raffle tickets for this as I have friends who are affected by autism. I am sure the UK Blog Awards will go from strength to strength. I do not intend to take part again, but I am sure that my blogs have had more views and gained more followers through being entered than if I hadn’t bothered. My memorable evening gave me lots to talk about to my family and friends in the following days. I may even have more to write here another day about the benefits of joining in. It was really good to meet you, Sue, at the National UK Blog Awards evening. Your bag looks superb, much better than mine, as they messed up the colours somewhat. So glad you got the chance to speak to so many influential people. Perhaps the colour-cartridge or whatever they use was running out of ink for yours. You gave me the idea of how to use the wall to good effect. Thank you for this report. This is exactly the sort of thing that I recommend doing in some of my posts. It’s fun to meet bloggers in person and it’s good to keep your name and your blog out in the public eyes. Great job and I’ll look forward to hearing more. I may be contacting you in the near future about a guest post regarding this topic. First I want to let the A to Z smoke clear and get my Reflections post out of the way. I’ll make a note on my schedule right now so I don’t forget..